If you are trying to view my site via your smart phone or your tablet, I’m sorry if it’s not as responsive as it should be. I am currently working on a new site design for Kitoula’s Greek Food Journal so that my content looks great on every screen, no matter the size. Please bear with me and accept my apology. If you are a “techie”, you may have heard about Google’s new algorithm. The algorithm, which starts tomorrow, will favor sites with mobile-friendly designs. Blogs that have large text, easy-to-click links, and that resize to fit whatever screen they’re viewed on will rank higher in search results. This is what my site looks like now on a smart phone, not bad, not great either. 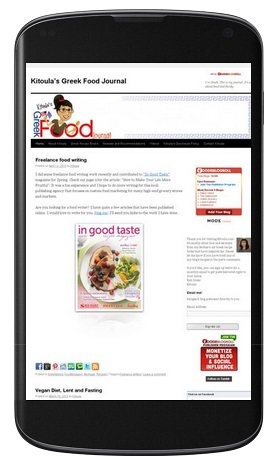 But, I promise, the new mobile-friendly site design for Kitoula’s Greek Food Journal will be coming soon!